The Atari 7800 was released by Atari in 1986 (a test market occurred in 1984). The 7800 was designed to replace the failed Atari 5200 shortly after the video game market crash of 1983 and was supposed to re-establish Atari's market supremacy. Atari learned from their mistakes with the 5200 and used digital joysticks, included full software compatibility with the Atari 2600, and released the 7800 with an affordable price. The 7800 was also the first game system from Atari which was designed by an outside company (by the General Computer Corporation, future consoles designed outside the company were the Atari Lynx and the Atari Jaguar). The 7800 was upgraded to be a full-fledged home computer. A keyboard was developed, which included an SIO port so peripherals like disk drives and printers could be used. GCC also designed a high score cartridge, which was a battery-backed RAM cart used to store high scores taken from games. Atari manufactured none of these accessories, but in 1987, the Atari XEGS was released, which came with a light gun, called the XG-1. 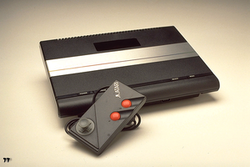 The XG-1 was fully compatible with the 7800 and the 2600, and Atari released four games on the 7800 that utilized it. The 7800 was test-marketed in southern California in June 1984. One month later, Warner Communications sold Atari to Jack Tramiel, who wanted the company to stay away from the video game business. He abandoned all projects related to video games and decided to focus on Atari's existing computer line in order to begin development of the new 16-bit computer line. The 7800 was re-introduced in 1986 due to Nintendo's success with the NES, proving the video game market was still alive. However, Nintendo had more than 90% of the market cornered, with rival Sega's Master System taking up the rest. The 7800 faced the severe software drought that would become the mark of all Atari consoles sold after the video game crash. Relatively few titles were released by Atari, many of them lacking, or even games that were released on previous Atari systems. Atari focused no effort finding or recruiting third party developers, which led to a rapid decrease in interest. On January 1, 1992, Atari formally announced abandonment of the Atari 7800, in addition to the Atari 2600 and the Atari 8-bit computer line, including the Atari XE Game System. Pages in category "Atari 7800"
This page was last edited on 26 April 2015, at 02:06.